I realise some readers might not know much about Reunion Creole, the language which is spoken as mother tongue by about 90% of the population* on the island where I live, La Réunion, in the Indian Ocean. 1) Until the late 17th century the island was uninhabited so there was no local population and thus no indigenous language. When the island started being inhabited it was initially by people from France and Madagascar, later by slaves from East Africa. When slavery was abolished in 1848 indentured labourers were brought in from India and China. All these factors led to a linguistic melting-pot, with French dominating but with input from Malagasy, Portuguese, Tamil, Gujarati and Hindi, and this led to the development of Réunion Creole. 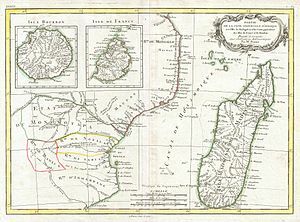 1770 Map of East Africa, Madagascar, Reunion Island (Isle Bourbon) and Mauritius (Isle de France). 2) What is a Creole? Briefly, a Creole is a language which has developed from parent languages and which is spoken as the native language by those growing up where the Creole is spoken. The word itself comes from criollo (Spanish) and crioulo (Portuguese), words used in the 16th and 17th centuries in the colonies to describe those born and raised locally as opposed to those who immigrated as adults. A study carried out in 1977 by Ian Hancock counted 127 different Creoles world-wide, 15 of which are French-based. Le Tampon is a local place name which comes from the Malagasy tampona, meaning ‘summit’. 4) Certain words came from elsewhere in the French colonial empire, for example kaz (also case), which comes from the Spanish and Portuguese casa via Guadeloupe and Martinique. 5) The meaning of some words have been transformed or adapted from their original French, for example kanyar (cagnard) means thug, and bonbon la fesse (literally “bottom candy”) is a suppository. 6) Today Reunion Creole still has no official orthography. It is not taught in schools, but university students can study for a degree in it. 7) Some books and poems have been written directly in Creole, and others have been translated, for example The Little Prince, Asterix, and Tintin. * As of 1st January 2012 the population was 837 868 inhabitants. Hi! I envy you living on such a beautiful island. My brother-in-law originates from Mauritius, another wonderful island with a great cultural mix. Does kanyar mean dodger (a canopy or screen to protect e.g. the crew of a yacht from spray and spume)? In Sri Lanka (where my wife originates) – and elsewhere – the aubergine is known as brinjal, likewise derived from the Portuguese term. Seems like you have a very international family! I’ve already heard ‘brinjal’ used in Indian English as well. I’ve never come across “kanyar” with the meaning you mention, here it has the meaning of ‘petty criminal’. I remember a very funny conversation between a local and a visiting government Minister from the south of France, where “cagnard” means ‘stifling heat’. Neither understood what the other meant! I found your blog via your post to LinkedIn and was intrigued by your mention of Creole. Do you happen to speak Reunion Creole also? I live in Guadeloupe, and down the street from my house there is a hand-painted sign with a message quite similar to yours pictured. I have heard much about the incredibly mixed society of Reunion, especially in contrast to the rather segmented societies of Guadeloupe and Martinique. Hello to a fellow expat DOMienne! I’ve spent many years on Reunion, and while so far I’ve never learnt Creole formally in a classroom situation (lack of possibility, rather than not wanting to), I can get by pretty well. I understand better than I speak. It’s true that we’re very lucky in Reunion – I’ve travelled quite a lot and I’ve yet to come across a place like Réunion where different cultures and religions can live together so harmoniously side by side. Even in Malaysia the Indians, Chinese and Malays live in the same country but fairly separately from what I saw. Hi! What a beautiful language you have and What a beautiful island! I’m studying Creole linguistics in grad school and I’m very eager to study Reunion Creole..
I’m wandering if you gave me a hand.. I can try, but don’t forget I’m not a native speaker! What help do you need? Is that sign typical of Réunion Creole? I ask because it looks like the sign is in French aside from the word “zot” (which obviously would be “vos” in French). Reunion Creole is a Creole quite similar in some respects to French; here the verb ‘met’ is declined in Creole, and ‘cases’ means ‘house(s)’ which is not its meaning in French. For a longer example of Creole see: https://asmarttranslatorsreunion.wordpress.com/2013/11/16/european-day-of-multilingual-blogging-reunion-creole/. I would love to go to Réunion.